Lory and Malcom are more than happy to assist you with any questions you may have. All enquiries can be made by either phone, email, our social pages or by filling in the contact form below. We look forward to assisting you. To browse our jerky products, or to make a purchase, visit our online jerky shop. To save you some time, we will provide some answers to the most frequently asked questions. Q. 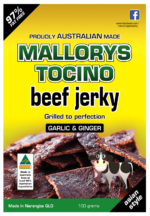 Where can I buy Mallorys Tocino Jerky? A. Via our website or catch us at local markets, in and around Brisbane, Caboolture, and the Sunshine Coast. Q. Can I save on postage? A. Yes you can. Buy 10 or more 100g packs of jerky and receive free postage. We will also run other promotions from time to time. Q. Does the jerky come in various meats and flavours? A. Yes, we make our jerky from 100% Australian grown and fed, chicken, pork and beef. Our jerky comes in a variety of flavours. Q. Can I buy in bulk? A. Yes. There are no minimum or maximum order requirements. Q. I am a retailer, can I stock your jerky? A. Yes. We welcome you to join our other stockists, and buy wholesale. Q. Is your jerky healthy? A. Yes, we deem our jerky a healthy protein snack, as it is 97% fat free. It is a great alternate snack to some other high fat foods.